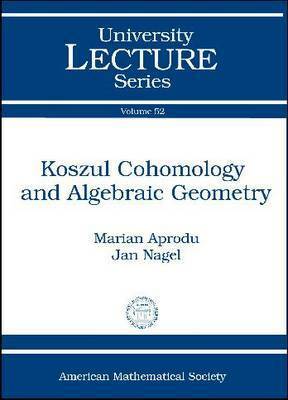 The systematic use of Koszul cohomology computations in algebraic geometry can be traced back to the foundational work of Mark Green in the 1980s. Green connected classical results concerning the ideal of a projective variety with vanishing theorems for Koszul cohomology. Green and Lazarsfeld also stated two conjectures that relate the Koszul cohomology of algebraic curves with the existence of special divisors on the curve. These conjectures became an important guideline for future research. In the intervening years, there has been a growing interaction between Koszul cohomology and algebraic geometry. Green and Voisin applied Koszul cohomology to a number of Hodge-theoretic problems, with remarkable success. More recently, Voisin achieved a breakthrough by proving Green's conjecture for general curves; soon afterwards, the Green-Lazarsfeld conjecture for general curves was proved as well. 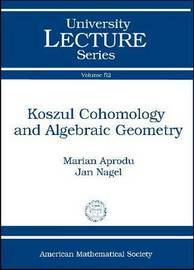 This book is primarily concerned with applications of Koszul cohomology to algebraic geometry, with an emphasis on syzygies of complex projective curves. The authors' main goal is to present Voisin's proof of the generic Green conjecture, and subsequent refinements. They discuss the geometric aspects of the theory and a number of concrete applications of Koszul cohomology to problems in algebraic geometry, including applications to Hodge theory and to the geometry of the moduli space of curves.